Drone technology has been revolutionizing many industries, including the construction industry. Unmanned aerial vehicles, or drones, provide an unprecedented high quality bird’s eye view of a location, and a span of the whole area. The high definition views that drone technology provides to site managers, contractors, clients and investors influence how a project is managed, the amount of labor put into construction and even how contractors communicate to clients. Before the rise of drone technology, every aspect of construction involved an intense amount of physical and manual labor, involving long hours of work. The resource and work-intensive nature of the job makes human mistakes more likely to happen. People can miss out on little details that are actually crucial to the process. Tracking and managing progress, surveying new and existing structures, and following even the smallest details require a lot of work. A mistake in these areas can lead to huge and expensive disasters. 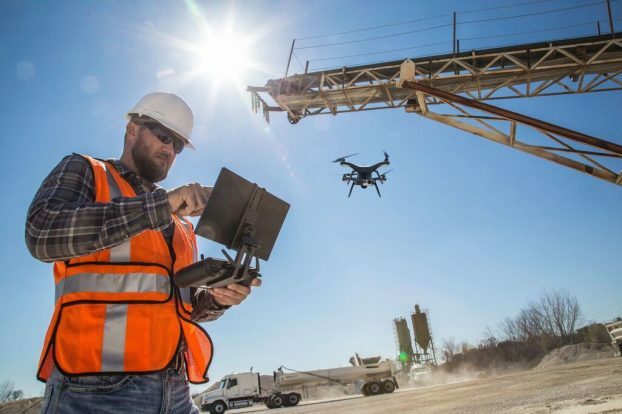 Many aspects of construction are augmented by drone technology. Before a construction project can start, planning has to take place. Specialists from architects to local authorities have to decide on what the area can accommodate and so on. Building maps is an integral part of surveying. Traditionally, heavy equipment, expensive tools and a ground team have to be used in order to get an accurate picture. Drones remove those time and cost expenses and also ensure greater accuracy. Drone technology can render a #D map with a simple software program. Managing a job site is an intensive job. For construction site managers, it is a responsibility that results to a lot of stress and work. Missing a small mistake can mean the difference between a collapsed addition or a successful installation. Drone technology allows for simultaneous monitoring and management. Managers can look at multiple job sites, and different levels, at the same time. They can examine compliance to safety standards too. The comprehensive viewing of the project can help managers and experts assess if the project is still on-track or off-track. Engineers on the ground can immediately be contacted and shown footage for their input. The edge of drone technology is in its real-time processing of data. Delays are cut short because of the mobile communication technology. Managers can quickly tell workers to stop working on a particular level if there are issues with the execution or foundation. Work is completed faster and managed better with drone technology. Construction projects succeed because of the input, support and collaboration of off-site stakeholders. Drone technology shots and footage can communicate information better than limited still photos and traditional descriptions. These videos can be shown to clients if they can’t come onsite. Through the footage, the team can show a tour, highlights reel or perspectives. They can also impress investors too. Aerial photography adds a level of professionalism to the presentation. Thinking about using drone technology in your project? Talk to a construction expert now.